Comprehensive sheet; unique subjects; outstanding support material; stencil markings a'plenty. 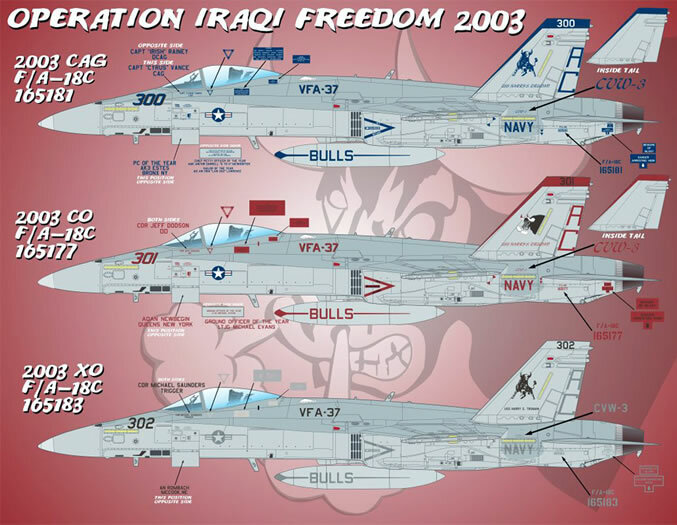 More “big sheet” decals from the guys at Afterburner Decals. 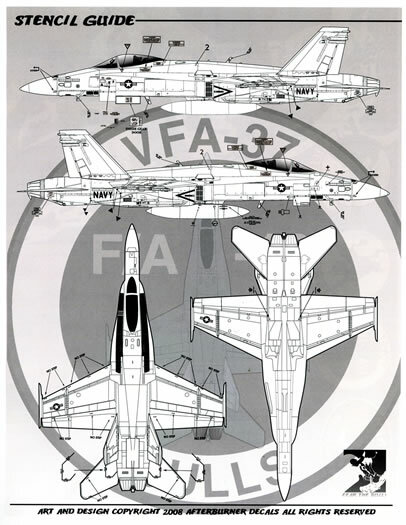 One of their two latest releases is AD 48-035 and it provides markings for six F/A-18C Hornets of VFA-37 from 2003, 2007 and 2008. 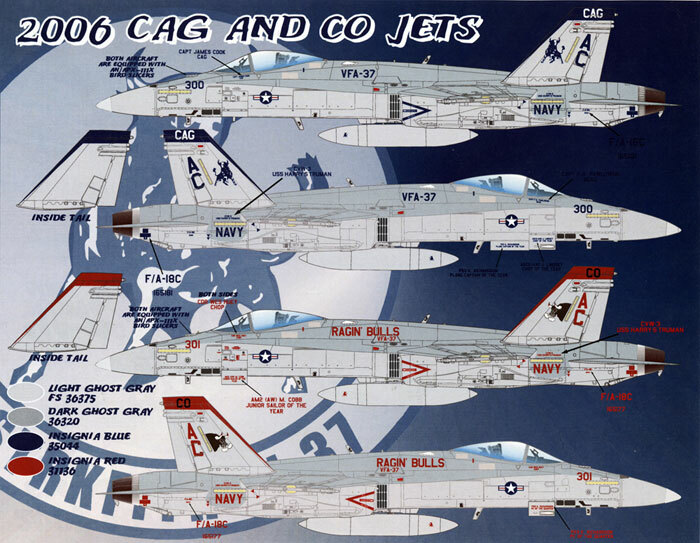 Whilst VFA-37’s Hornets wear the standard Tactical Paint Scheme (TPS) of Federal Standard 36320 dark ghost grey over Federal Standard 36375 light ghost grey it is the colourful markings and trim applied to their CAG, Commanding Officer’s and Executive Officer’s machines that make them stand out from their Atlantic Fleet sisters. Bureau number 165181, modex 300, the CAG bird from 2003 as it appeared during Operation Iraqi Freedom (OIF). In standard TPS she wears blue trim to the leading edges and fin caps of her vertical stabilisers (provided as two-part decals) to set her apart from the other Hornets in the squadron. Her markings (including her stencil data) are all in the same shade of blue and she sports full colour national insignia. The earlier “square” style of AC air wing indicators appear on her rudders as well as the rampant bull marking on her vertical stabilisers and cursive style USS Harry S. Truman and CVW-3 titles. 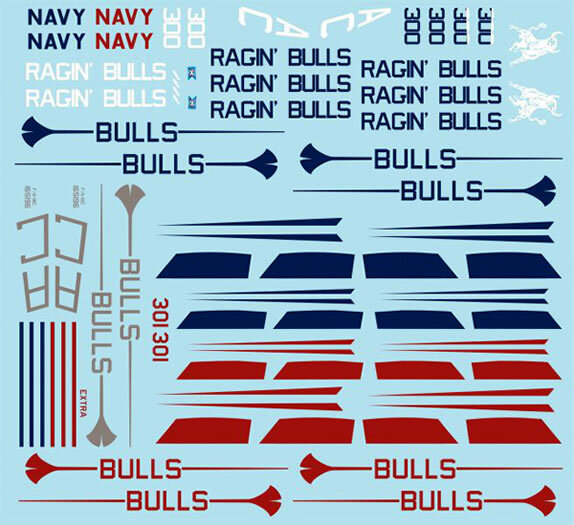 The centre line drop tanks are also marked up with blue trim and BULLS titles. Her modex and VFA-37 titles have black “shadowing”. The Commanding Officer’s machine from 2003 and used in Operation OIF, Bureau number 165177. Marked up in essentially the same style as the CAG bird, however, this machine is painted in red trim rather than blue. This is unusual to say the least as VFA-37 has traditionally worn blue trim associated to its role as an attack squadron, the red trim normally being associated to fighter squadrons in the 100 and 200 modex range. Nonetheless, she is certainly a strikingly marked machine. She also wears the alternative “snorting bull” squadron marking on her vertical stabilisers. Her modex and VFA-37 titles also have black “shadowing”. Bureau number 165183, the Executive Officer’s aircraft from 2003 as used during Operation OIF. A plain bird this one, she wears the same basic squadron markings (less the trim to her vertical stabilisers) but all in lo-viz greys and black, including her national insignia. Her USS Harry S. Truman and CVW-3 titles are also in normal “block” font. Bureau number 165131 modex 300, the CAG bird from 2006. In essentially the same markings as the 2003 CAG bird except that her air wing indicators are now in “block” style and have been applied on her vertical stabilisers and CAG titles on her fin caps. 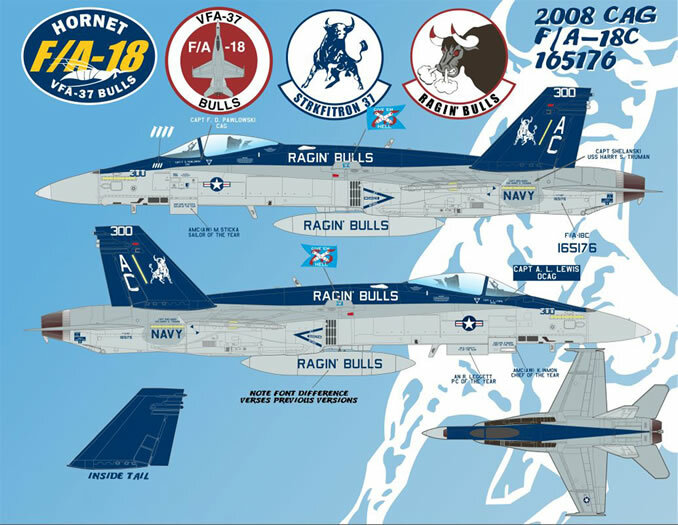 The squadron rampant bull also wears white highlights, and the black shadowing has been removed from her modex and VFA-37 titles. Bureau number 165177 modex 301, The Commanding Officer’s aircraft from 2006. Still wearing red trim, her markings have changed a little since 2003 the main changes being that the black “shadowing” has been removed from her modex and VFA-37 titles, she has CO titles on her fin caps in place of the 301 modex. She wears RAGIN’ BULLS titles on her spine and the VFA-37 titles are now on the LEX fences. The AC air wing indicators are now on the vertical stabilisers too. Bureau number 165177 again but this time the provided markings depict her as she appeared in 2007 during the 40th anniversary of the squadron. She is now the CAG bird and marked with 300 modex with all of her markings in red with full colour national insignia. Her markings have changed slightly too. 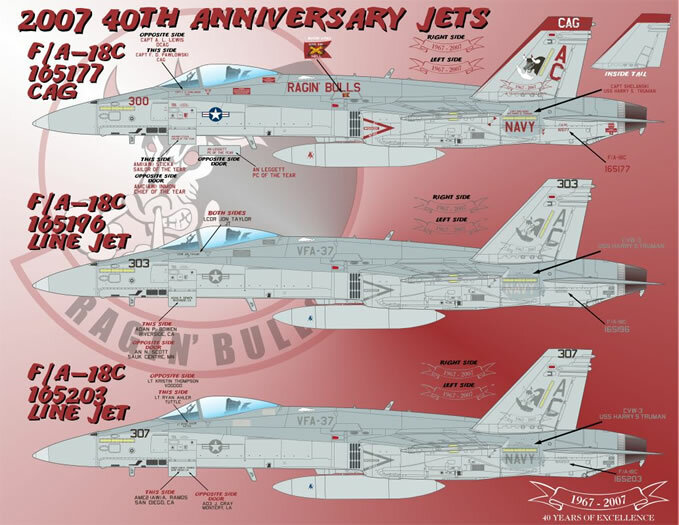 The VFA-37 titles on her spine are gone and have been replaced with the words RAGIN’ BULLS and she also wears ribbon banners on her vertical stabilisers (1967 – 2007) with the words “40 years of Excellence” beneath them to celebrate the anniversary. The other changes include the BULLS titles being replaced by a small rampant style squadron insignia on her drop tank. Bureau number 165203, modex 307, another line jet from 2007. She also wears the same markings as the previous option. Bureau number, 165176, the current VFA-37 CAG bird. Back to blue trim again from the previous red. The amount of blue trim has certainly grown and now covers the entire top of the fuselage as well as the inner and outer faces of the vertical stabilisers. The spine wears RAGIN’ BULLS in white, with her squadron rampant bull rudder marking also being in white as are the 300 modex on her fin caps and the AC air wing indicators too. The full RAGIN’ BULLS titles are back on her drop tanks (in a different font) and she wears four white mission marking bombs on the port side of the nose as well as a small blue pennant on her LEX fences with crossed cannons and the words “Give em hell” superimposed over a red 75. As mentioned above, this is a big sheet! 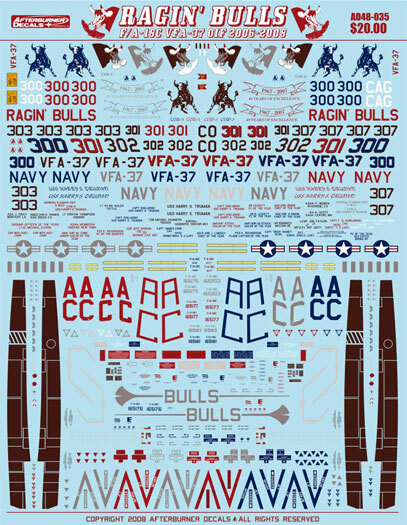 The main decal sheet measures 7¾" x 10¼" (200mm x 260mm) and is absolutely crammed full. There is also a second smaller sheet provided too. The decals have been printed in Italy by Cartograf. They are thin, in perfect register with an absolute minimum of film surrounding each design. There appears to be three sets of stencil data provided with the appropriate differences – e.g. a red set, a blue set and a grey set. You also get two sets of black walkway markings, as well as a set of full colour and a set of lo-viz national insignia. 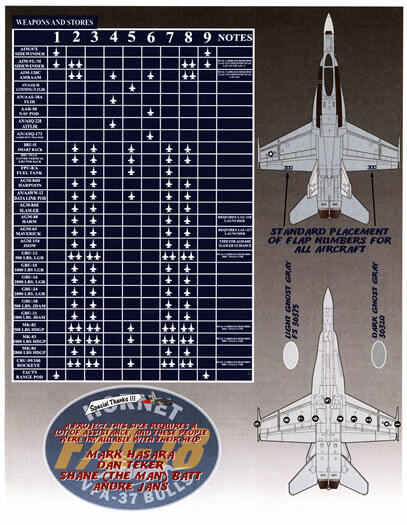 As with all of the other Afterburner sheets I have seen, it is the support material they provide which makes them stand out from the others. This sheet is no exception and the decals are accompanied by four pages (these are the same size as the large decal sheet). These pages are all double-sided (bar one) and provide information on the placement of the squadron markings as well as the stencil data and the stores carried by the Hornet on the appropriate pylons. All of these pages are good quality glossy paper and show full colour profiles of each option. The support sheets and the two decal sheets come packed in a clear plastic zip-loc bag. If you like colourful GAG birds and Commanding Officer’s jets then this is a great sheet. It provides markings for machines in both red trim and blue trim. Fans of “line birds” are also catered for with markings being provided for two of them. As well as this, you are provided with complete stencil data and enough markings to build at least two 1/48 scale Hornets from the sheet.